Only one more week left to go in Project Horror! I've got another night of Creepy Creatures, five nights of The Evil Men Do, and then I'll be ending the month with one that I choose. 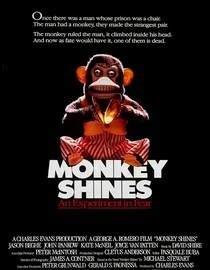 Tonight's selection was George Romero's Monkey Shines. Although I was aware that he'd done some non-zombie movies, this is the first of them that I've seen. I've got to hand it to Romero - he doesn't just have an eye for zombies, he's got a talent for horror of all stripes. The plot is pretty straightforward. A promising young law student is made quadriplegic after an accident, and is given a helper monkey to assist him around his home. He and the monkey form a close bond, and the monkey becomes fiercely protective of him, soon even acting out his unconscious desires for revenge. OK, that sounds kind of silly when I type it out, but this movie was very effective. There are a few good "jump" moments when the monkey does something unexpected, but the real fear comes from our shared fear of vulnerability. By the time that the main character becomes aware of what's happening, he's physically helpless to fight against it. He can see things unfolding in front of him without the ability to stop it. There was another thing that makes it work, and that's man's uneasy belief that he has some kind of dominance over the natural world. This is especially apparent in the scenes where monkeys are being experimented on in the lab, but also when the main character tries to appeal to his monkey to stop. Did you ever see the documentary Grizzly Man? Werner Herzog directed it, and it tells the story of a man named Timothy Treadwell, a man who made it his personal mission to live among Alaskan bears and share their story with the world. He also saw his mission as defending the bears, but found out that they actually do a pretty decent job of defending themselves when he and his girlfriend were eaten while their camera recorded. The thing is, before this happened, Treadwell honestly believed that these bears loved him. When Herzog viewed Treadwell's footage, he had this to say: "I discover no kinship, no understanding, no mercy. I see only the overwhelming indifference of nature." That is what makes this movie work. When it comes down to it, you can't appeal to an animal, because it will follow its instincts. Just ask Siegfried & Roy. This was a fun movie, one of the few this month to put a real scare into me. I give it four capuchins out of five.